A California couple helps rescued wolves and veterans with PTSD forge lasting bonds. About 90 minutes north of Los Angeles at the Lockwood Animal Rescue Center (LARC), healing magic happens every day. Nestled on acres of scenic land inside theLos Padres National Forest, LARC’s Warriors and Wolves program offers combat veterans suffering from post-traumatic stress disorder the chance to bond withwolves and wolfdogs that have been rescued from abusive situations or abandoned because their wild roots make them poor pets. Together they heal and gain a sense of belonging — and a second chance at life. Simmons is intimately familiar with the horrors of post-traumatic stress disorder (PTSD). After serving in the Navy, including a stint in Desert Storm, he returned home and launched a computer company. He felt focused and successful, but the harrowing memories of combat lay buried, waiting to surface. He began waking at night soaked in sweat and felt strangely agitated after business meetings. As his sleeplessness and emotional turbulence grew, Simmons consulted a psychiatrist who prescribed sleeping pills. He was soon popping a few at a time and washing them down with wine. “By this point I’d sold my computer company and was in turmoil, drinking too much and taking too many pills,” he says. Desperate to stop his downward slide, Simmons visited another psychiatrist who diagnosed him with PTSD and suggested getting immediate help through the Veterans Administration (VA). PTSD can develop after traumatic events, including combat, and may cause nightmares, flashbacks, detachment, angry outbursts, addiction and sometimes suicide. But he heeded the advice and connected with the VA Medical Center in West Los Angeles where he soon found himself volunteering to care for abandoned parrots and other exotic birds living on-site in the Serenity Park Sanctuary. Run by licensed clinical psychologist Lorin Lindner, the eco-therapy program helps traumatized veterans and traumatized birds recover together. The experience changed his life. “That’s where I met the three animals I believe have kept me safe, sane and sober,” Simmons says. The first two were Maggie and Ruby, feral parrots from San Francisco that had barely survived a brutal raccoon attack. “I watched them physically heal, and whether I was cognizant of it or not, I watched them forgive and let go,” Simmons says. Gaining their trust and nursing them back to health helped him release his own emotional wounds. His third guardian “animal” was Dr. Lindner, now his wife. In 2007, the couple bought a remote property outside Los Angeles in Frazier Park, known for its panoramic mountain views and pristine beauty. They started LARC, a privately funded non-profit, and began rescuing abused horses. At the same time, they learned about captive wolves and high-content wolfdogs (wolves with dog heritage) also in need of forever homes. Many are bred as exotic pets, only to be relinquished to shelters or permanently chained outside for exhibiting natural “wild” and “aggressive” wolf behaviors rooted in their DNA. 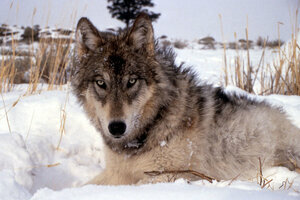 Wolfdogs aren’t eligible for adoption at shelters so are usually euthanized. The couple also continued rescuing wolfdogs, including 29 that had spent their lives chained in a small enclosure at a roadside wolf attraction near Anchorage, Alaska. Former game show host and long-time animal activist Bob Barker donated $100,000 to fund the rescue. The cornerstone of Warriors and Wolves is the idea that nature can heal a broken spirit. Veterans — who are either employed by LARC or volunteer — go on nature hikes and participate in stream-bed restoration, but the heart of their work is caring for the wolves and wolfdogs, who, like them, are outsiders and often misunderstood. Most remarkable is the special solace and healing they find together — a bond that lasts for life. And it’s not just with their soulmate animal; veterans are also accepted into the wolf pack where they learn about family and trust. Many of the veterans go on to good jobs, often working with animals. Those who need more time can transition to the New England Wolf Advocacy and Rescue Center (NEWARC) in New Hampshire, which Simmons and Lindner started in 2013. Veterans live and work there for six months to a year, earning a good salary and continuing to heal. Many are able to reconnect with wives and children they pushed away during their PTSD battles and repair damaged relationships.